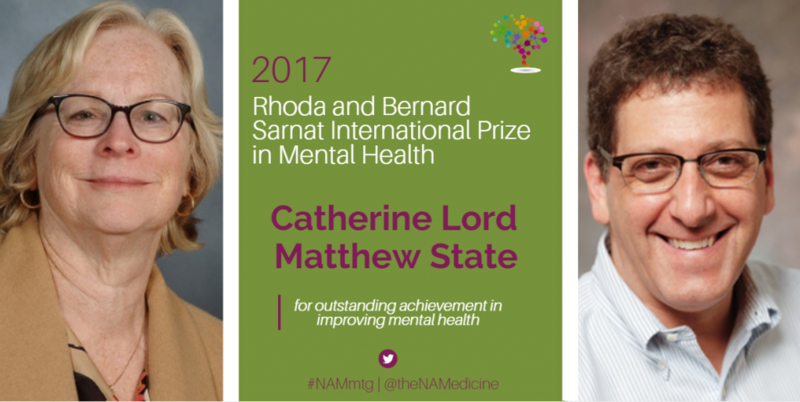 The National Academy of Medicine (NAM) today awarded 2017 Rhoda and Bernard Sarnat International Prize in Mental Health to Joseph Coyle, whose research laid the foundation for integrating neuroscience and clinical psychiatry and shifted psychiatry’s emphasis toward empirically based brain research; and to the team of Catherine Lord and Matthew State, whose work revolutionized the study of autism and related neuropsychiatric disorders. Joseph Coyle’s work facilitated recognition of the central role of the brain in psychiatric disorders and by doing so improved the understanding and treatment of these disorders. His pioneering research illuminated some of the neurological mechanisms underlying Huntington’s disease, schizophrenia, and Alzheimer’s disease. For example, his research revealed that oxidative stress can lead to neural damage in schizophrenia and prompted the identification of acetylcholinesterase inhibitors as a treatment for Alzheimer’s disease. Coyle also made significant contributions to clinical psychiatry, transforming the Division of Child and Adolescent Psychiatry at Johns Hopkins into one of the country’s top divisions in this field and contributing to the literature on psychopharmacologic management of serious mental disorders in children. Coyle served as the chairman of the academic Department of Psychiatry at Harvard Medical School from 1991 to 2001, and is currently Eben S. Draper Professor of Psychiatry and Neuroscience at Harvard Medical School in Boston and McLean Hospital in Belmont, Mass. Catherine Lord, director of the Center for Autism and the Developing Brain and professor of psychology in psychiatry and pediatrics at Weill Cornell Medicine in New York City, designed gold-standard diagnostic instruments for autism spectrum disorders that have facilitated genetic and neuroscientific research as well as clinical practice. Matthew State, Oberndorf Family Distinguished Professor, chair of psychiatry, and member of the Weill Institute for Neurosciences at the University of California, San Francisco, has leveraged these efforts to become a world leader in the study of autism genetics and genomics, directing several of the earliest highly successful large-scale genomic studies and discovering multiple genes that contribute to risk of these disorders. Together, Lord and State led an innovative collaboration to create a publicly available repository of genetic and behavioral data on autism, involving nearly 3,000 individuals with autism and their families, which has revolutionized the study of autism and related neuropsychiatric disorders. “Through their pioneering research and clinical work, Joseph Coyle, Catherine Lord, and Matthew State have made profound contributions to the understanding of a range of serious neuropsychiatric disorders,” said National Academy of Medicine President Victor J. Dzau. Since 1992, the Sarnat Prize has been presented to individuals, groups, or organizations that have demonstrated outstanding achievement in improving mental health. The prize recognizes — without regard for professional discipline or nationality — achievements in basic science, clinical application, and public policy that lead to progress in the understanding, etiology, prevention, treatment, or cure of mental disorders, or to the promotion of mental health. As defined by the nominating criteria, the field of mental health encompasses neuroscience, psychology, social work, nursing, psychiatry, and advocacy. The award is supported by an endowment created by Rhoda and Bernard Sarnat of Los Angeles. Rhoda Sarnat is a licensed clinical social worker, and Bernard Sarnat is a plastic and reconstructive surgeon and researcher. The Sarnats’ concern about the destructive effects of mental illness inspired them to establish the award. Nominations for potential recipients are solicited from Academy members, deans of medical schools, and mental health professionals. This year’s selection committee was chaired by Huda Akil, Ph.D., Gardner Quarton Distinguished University Professor of Neuroscience and Psychiatry and co-director, The Molecular & Behavioral Neuroscience Institute, University of Michigan. To learn more about the Rhoda and Bernard Sarnat International Prize in Mental Health, please click here.